I have a project for you and so do a few of my friends. The theme this month is “Romantic”. Each blogger interrupted the theme to suit her style. 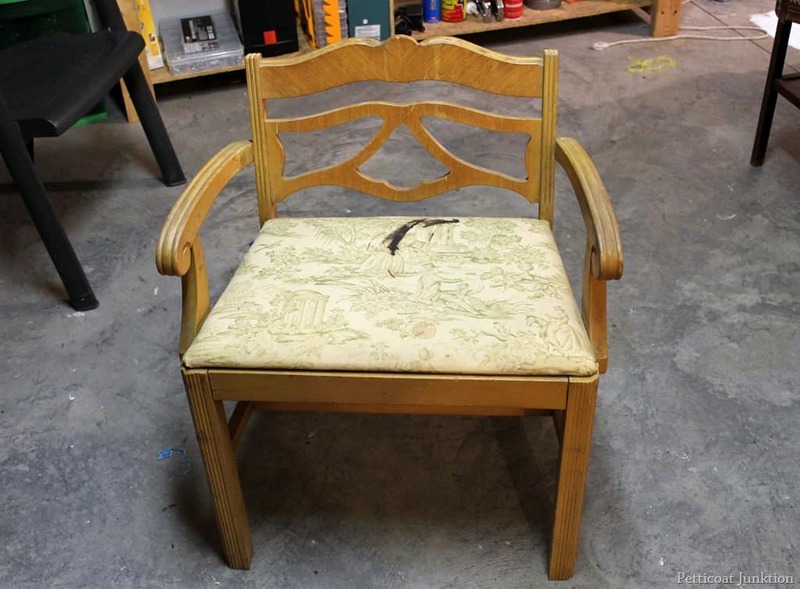 Really, can you believe this is the same chair? I love all the curvy details and the padded seat. I’m always drawn to this type of vintage vanity chair. Don’t know what it is about them? 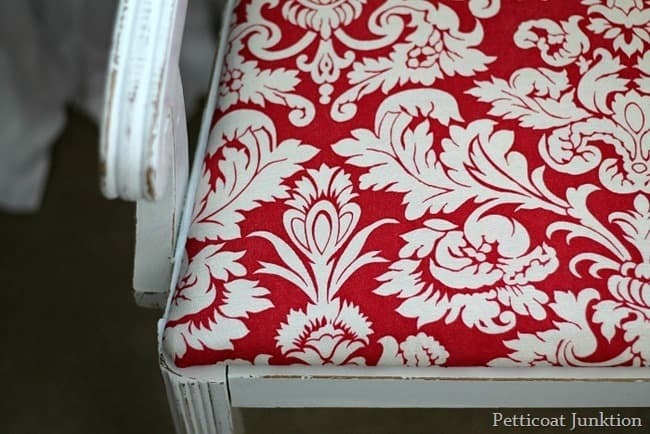 The red and white damask fabric is actually a curtain panel. 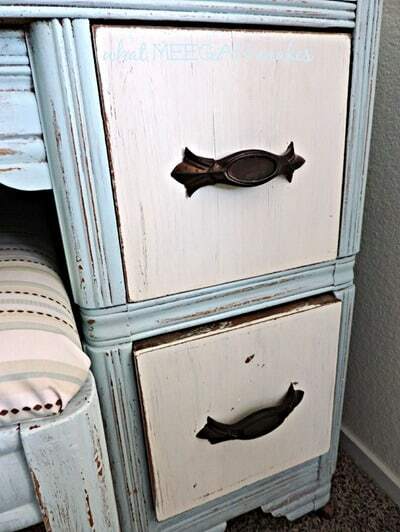 I purchased a pair of them at the local Habitat Restore ages ago. 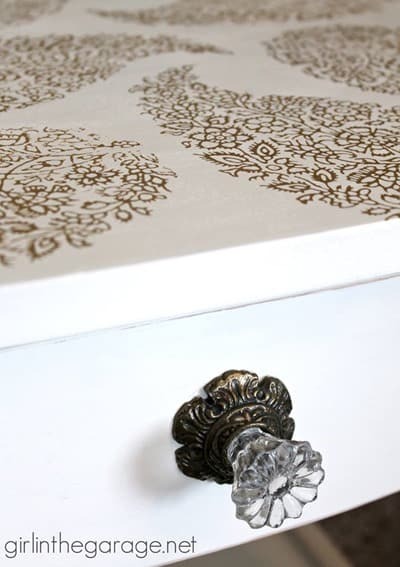 The curtains were a little frayed and worn but damask print happens to be one of my all time favorite prints. The red is what I would call a lipstick red…..red leaning toward pink! Do ya’ll know what I mean? 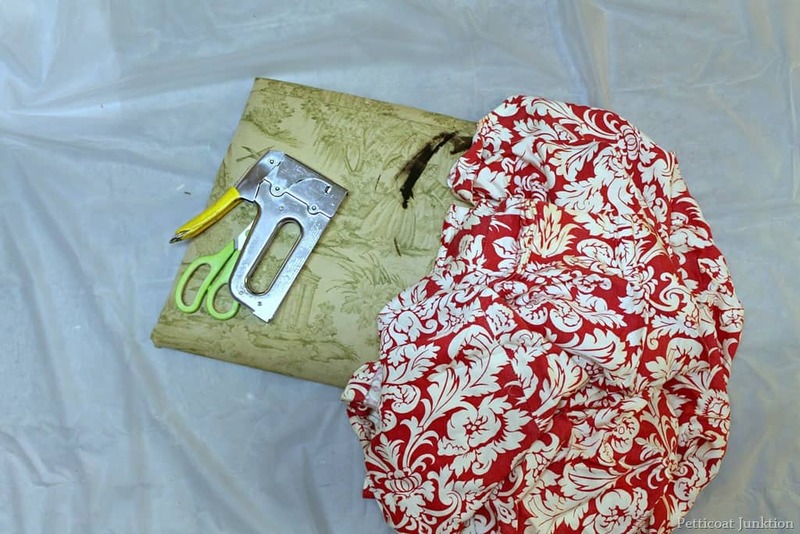 It’s really easy to cover a chair seat….cut the fabric a little larger than the seat……staple the two opposing sides first, pulling the fabric tight….finish the other two sides and corners. The corners are the hardest. Usually I can work out the folds in the corners. It helps if the fabric is on the thin side. 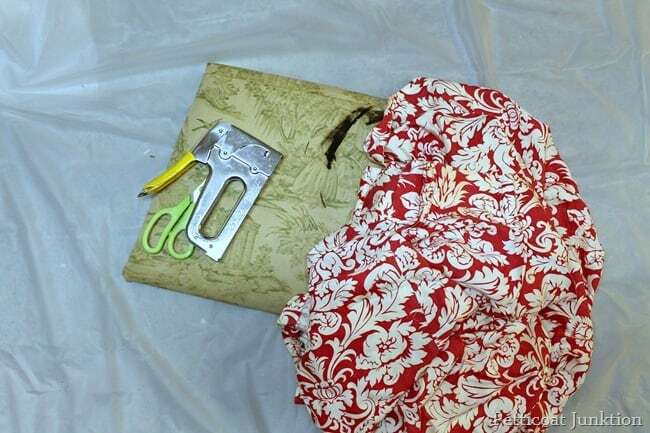 To stage the photo I laid a pretty little nightie over the back. 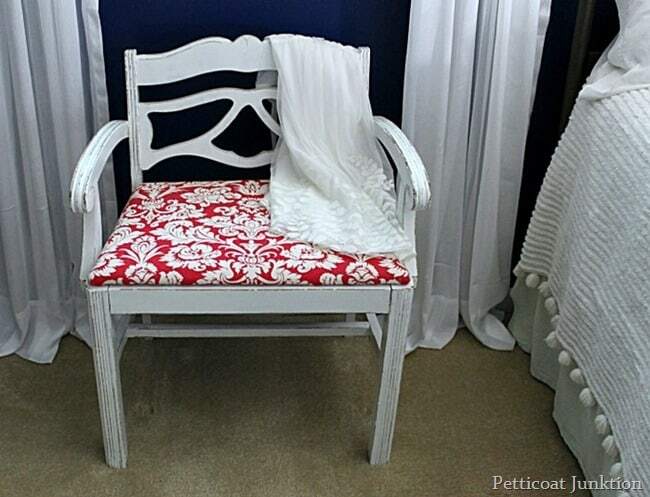 My take on the romantic theme……white paint…soft girlie fabric…..and curvy furniture. So what do you think? Want to see more red? 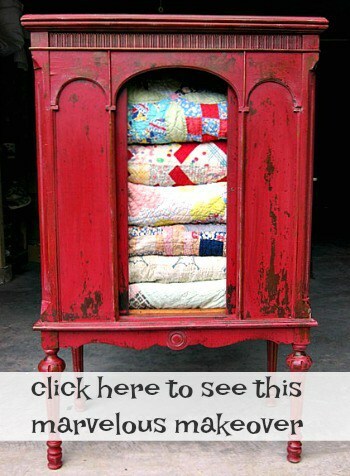 Click here……Rockin’ Red Radio Cabinet. 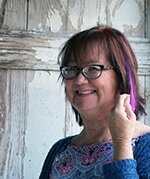 Visit the themed makeovers below then visit me again and share the scoop on the makeovers. 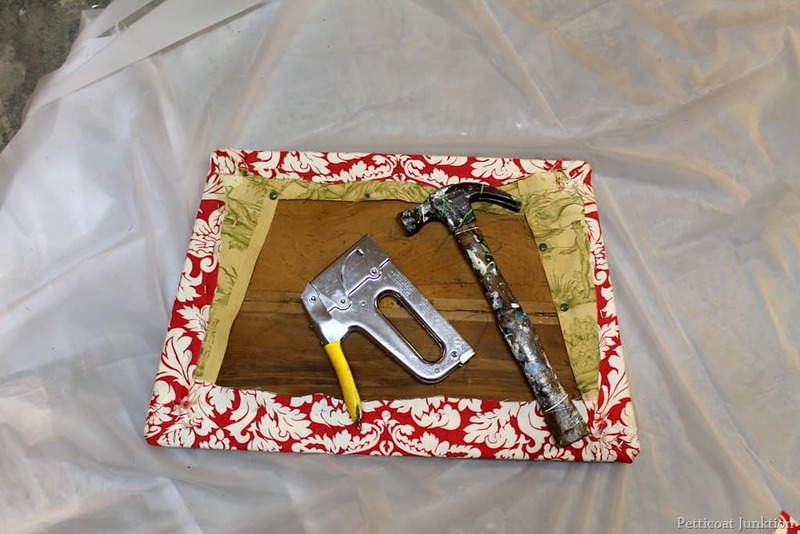 These are little teaser photos …click the “pink link” or the photos to see the completed projects! Remember to come back and leave me a little note after you visit my friends. This is really gorgeous I love the color! LOVE the fabric. 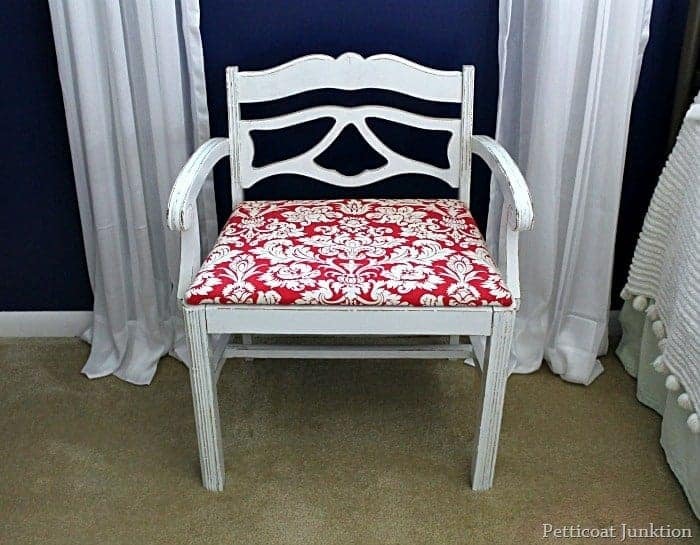 I have a chair I am hanging on to so I can cover it in cute fabric. It was my Grandma’s chair and I just couldn’t part with it! It is wood but after seeing yours, I might distress it white. This is soooo pretty my dear! I love that shade of red! Awesome job! Beautiful job, once again Kathy! You are so talented. Pinned and thinking about that lovely pop of red. No, it does not look like the same chair!! 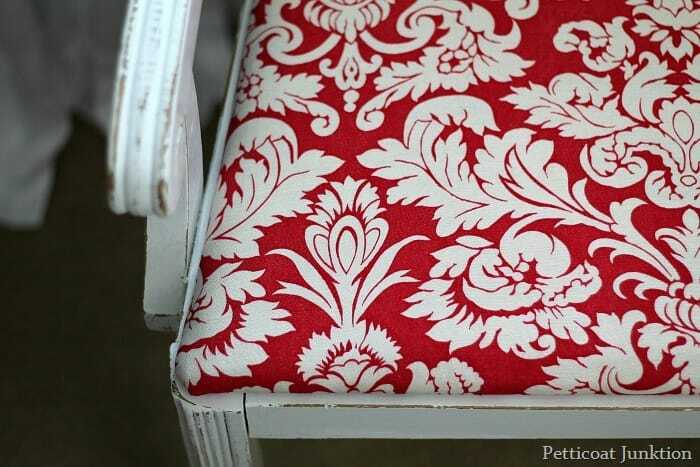 Love the red and love the idea of using old curtains for upholstery! 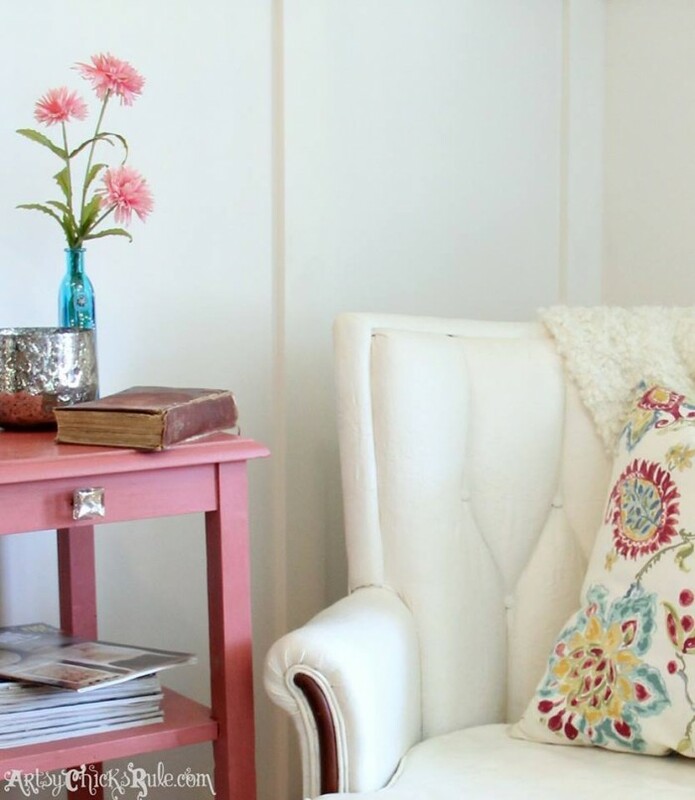 I have a similar vanity chair but have been unable to remove the cushion! Its screws are buried in deep holes and I can’t get to them! Do you have any tips for me? I love the red fabric and white paint on yours! Makes me really want to do something with mine! Thanks! 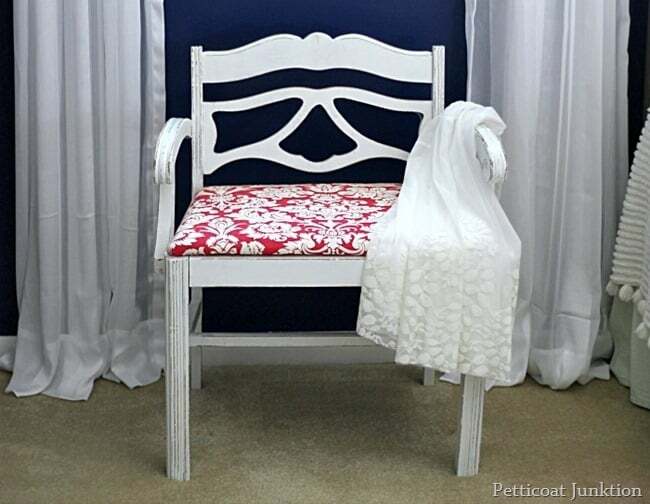 Love the chair, Kathy! The red and white is such a beautiful combination! 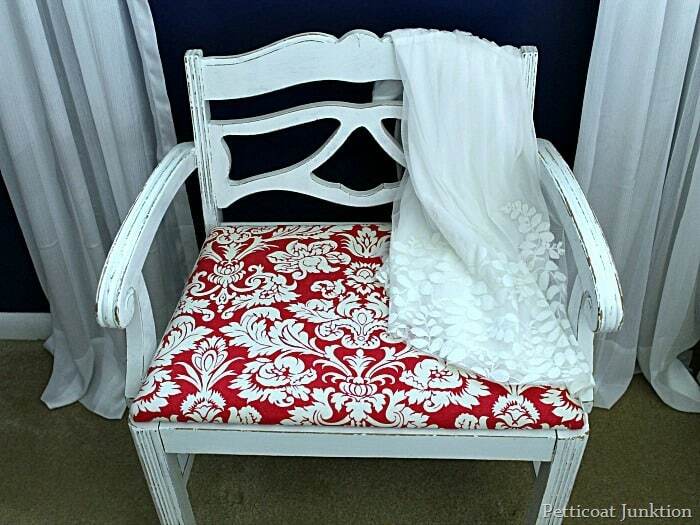 Red is so romantic and I’m in love with your chair redo and can’t get over your fabulous Restore find. 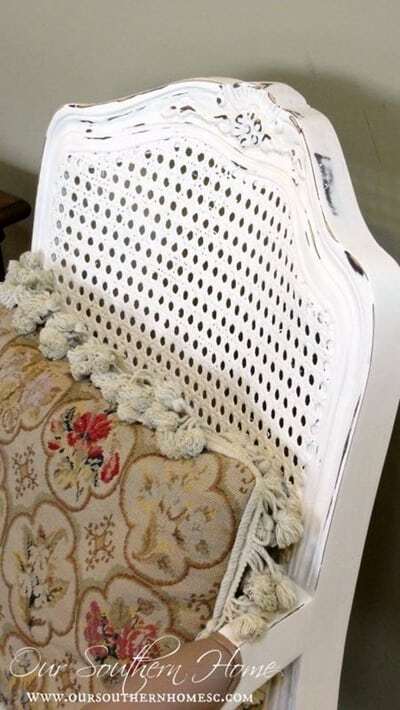 The damansk shower curtain is perfect on the chair seat. Beautiful work, Kathy! I always love to see what you do! Love, love, love this! The fabric is fantastic!! I did as you asked and visited all the sites and it was never more obvious that all of you like to distress your furniture. I especially liked the bench that Therese refinished. Quite a stylish piece. I’m always impressed with the work that all of the bloggers I follow accomplish. I love your little vanity chair, but the fabric was too bold and the print too large for my taste for such a dainty chair. 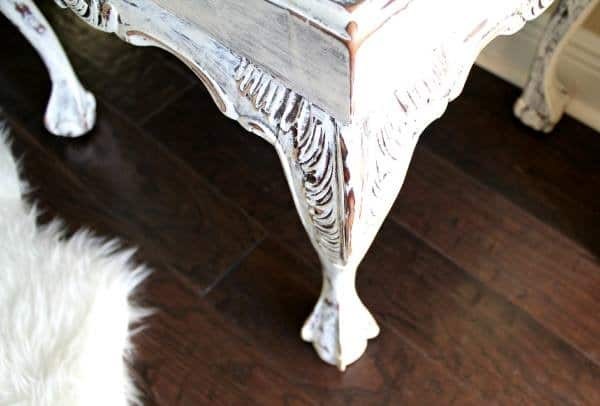 But, then again, I’m all for French style furniture and am jealous that I no longer have the room to re-do furniture. Have a great day. Very pretty Kathy! I am loving that red and white combo too! !